The Prophet series is the result of advanced peak prediction circuitry that calculates exactly when the peak will occur --that is, a 100% charge-- and stops fast-charging at exactly that point. Peak prediction technology prevents damage to the battery pack from overcharging, making the prophet chargers a safer way to charge Ni-Cds and Ni-MH packs at a very affordable price. 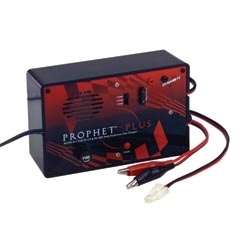 Dynamite's new Prophet Plus is a charger with versatility, flexibility, speed and style; an AC/DC peak prediciton charger that provides a perfect charge every time. The selectable charge rates will allow you to charge almost any car or receiver pack including Ni-MH and conventional Ni-CD cells, and because the Prophet Plus is AC/DC you can charge on the bench or at the track.